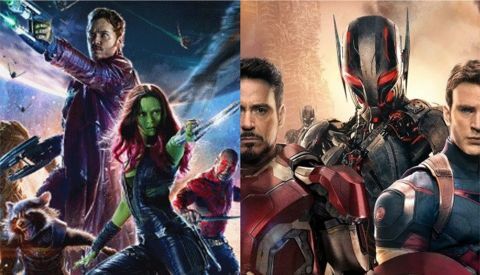 During a lengthy podcast interview, Guardians of the Galaxy director James Gunn has again reiterated that the film is its own entity distinct from the Avengers franchise and shouldn't be viewed as just another step toward Infinity War. Asked about the potential for a team-up between the Guardians and the Avengers, Gunn started by joking that his answer would be the only part of the interview anyone listens to, now that it's been asked. "The last thing I said was something about how the Guardians, we really are mostly focused on creating the Guardians as their own separate universe, creating the cosmic side of the Marvel Universe. It isn't all about leading towards Avengers," Gunn said. "We're not subservient to The Avengers. Whether or not at some point, some Guardians and some Avengers meet up and meet somewhere in the world, whether it's two years from now, three years from now, four years from now, fifteen years from now...I'm not going to say. But Guardians of the Galaxy does not exist as a prequel to Avengers 3 and 4. They have their own thing that they're involved in. They have their own mythos that they're involved in. They have their own stories that are equally important." He added that the film was the biggest hit Marvel has had which didn't feature Tony Stark/Iron Man, saying, "I don't want to make everything too small by focusing on this other thing. I think it's about making this world and this universe as big and as beautiful as possible." This echoes what Gunn had previously said about the fact that the film isn't designed to "set up" Infinity War in spite of both franchises featuring Thanos.